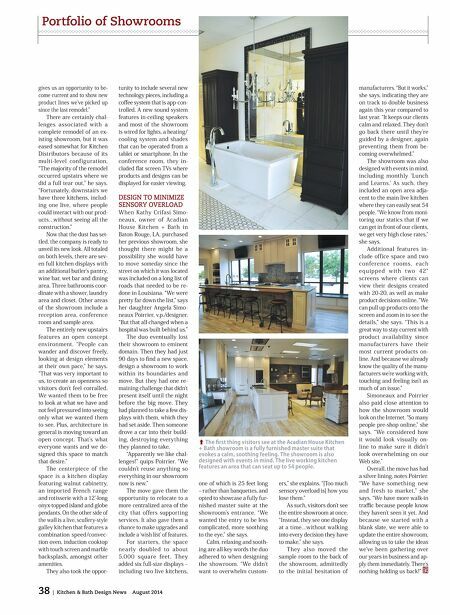 38 | Kitchen & Bath Design News August 2014 Portfolio of Showrooms gives us an opportunity to be - come current and to show new product lines we've picked up since the last remodel." There are certainly chal- lenges associated with a complete remodel of an ex- isting showroom, but it was eased somewhat for Kitchen Distributors because of its multi-level configuration. "The majority of the remodel occurred upstairs where we did a full tear out," he says. "Fortunately, downstairs we have three kitchens, includ- ing one live, where people could interact with our prod- ucts…without seeing all the construction." Now that the dust has set- tled, the company is ready to unveil its new look. All totaled on both levels, there are sev- en full kitchen displays with an additional butler's pantry, wine bar, wet bar and dining area. Three bathrooms coor- dinate with a shower, laundry area and closet. Other areas of the showroom include a reception area, conference room and sample area. The entirely new upstairs features an open concept environment. "People can wander and discover freely, looking at design elements at their own pace," he says. "That was very important to us, to create an openness so visitors don't feel corralled. We wanted them to be free to look at what we have and not feel pressured into seeing only what we wanted them to see. Plus, architecture in general is moving toward an open concept. 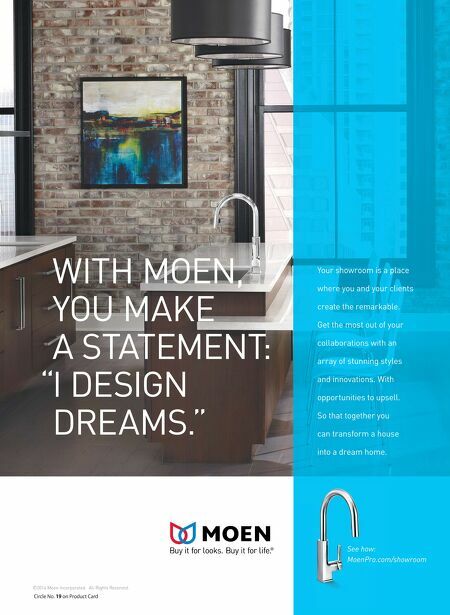 That's what everyone wants and we de- signed this space to match that desire." The centerpiece of the space is a kitchen display featuring walnut cabinetry, an imported French range and rotisserie with a 12'-long onyx-topped island and globe pendants. On the other side of the wall is a live, scullery-style galley kitchen that features a combination speed/convec- tion oven, induction cooktop with touch screen and marble backsplash, amongst other amenities. They also took the oppor- tunity to include several new technology pieces, including a cofee system that is app-con- trolled. A new sound system features in-ceiling speakers and most of the showroom is wired for lights, a heating/ cooling system and shades that can be operated from a tablet or smartphone. In the conference room, they in- cluded fat screen TVs where products and designs can be displayed for easier viewing. DESIGN TO MINIMIZE SENSORY OVERLOAD When Kathy Crifasi Simo- neaux, owner of Acadian House Kitchen + Bath in Baton Rouge, LA, purchased her previous showroom, she thought there might be a possibility she would have to move someday since the street on which it was located was included on a long list of roads that needed to be re- done in Louisiana. "We were pretty far down the list," says her daughter Angela Simo- neaux Poirrier, v.p./designer. "But that all changed when a hospital was built behind us." The duo eventually lost their showroom to eminent domain. Then they had just 90 days to fnd a new space, design a showroom to work within its boundaries and move. But they had one re- maining challenge that didn't present itself until the night before the big move. They had planned to take a few dis- plays with them, which they had set aside. Then someone drove a car into their build- ing, destroying everything they planned to take. "Apparently we like chal- lenges!" quips Poirrier. "We couldn't reuse anything so everything in our showroom now is new." The move gave them the opportunity to relocate to a more centralized area of the city that offers supporting services. It also gave them a chance to make upgrades and include a 'wish list' of features. For starters, the space nearly doubled to about 5,000 square feet. They added six full-size displays – including two live kitchens, one of which is 25 feet long – rather than banquettes, and opted to showcase a fully fur- nished master suite at the showroom's entrance. "We wanted the entry to be less complicated, more soothing to the eye," she says. Calm, relaxing and sooth- ing are all key words the duo adhered to when designing the showroom. "We didn't want to overwhelm custom- ers," she explains. "[Too much sensory overload is] how you lose them." As such, visitors don't see the entire showroom at once. "Instead, they see one display at a time…without walking into every decision they have to make," she says. They also moved t he sample room to the back of the showroom, admittedly to the initial hesitation of manufacturers. "But it works," she says, indicating they are on track to double business again this year compared to last year. "It keeps our clients calm and relaxed. They don't go back there until they're guided by a designer, again preventing them from be- coming overwhelmed." The showroom was also designed with events in mind, including monthly 'Lunch and Learns.' As such, they included an open area adja- cent to the main live kitchen where they can easily seat 54 people. "We know from moni- toring our statics that if we can get in front of our clients, we get very high close rates," she says. Additional features in- clude office space and two con ference room s, each equ ipped w it h t wo 42" screens where clients can view their designs created with 20-20, as well as make product decisions online. "We can pull up products onto the screen and zoom in to see the details," she says. "This is a great way to stay current with product availability since manufacturers have their most current products on- line. And because we already know the quality of the manu- facturers we're working with, touching and feeling isn't as much of an issue." Simoneaux and Poirrier also paid close attention to how the showroom would look on the Internet. "So many people pre-shop online," she says. "We considered how it would look visually on- line to make sure it didn't look overwhelming on our Web site." Overall, the move has had a silver lining, notes Poirrier. "We have something new and fresh to market," she says. "We have more walk-in trafc because people know they haven't seen it yet. And because we started with a blank slate, we were able to update the entire showroom, allowing us to take the ideas we've been gathering over our years in business and ap- ply them immediately. There's nothing holding us back!" ⬆ The frst thing visitors see at the Acadian House Kitchen + Bath showroom is a fully furnished master suite that evokes a calm, soothing feeling. The showroom is also designed with events in mind. The live working kitchen features an area that can seat up to 54 people.